Have you ever been guilty of “stinkin’ thinkin'”? All of us have done it before. We expected the worst and that is usually what we got. If we are not careful “stinkin’ thinkin'” will affect our marriages. Always thinking negatively about your husband or always expecting the worst outcome is a sure way to have an unhappy marriage. It is so crucial that you guard your heart and renew your mind daily. In marriage it is easy to gt upset and stay upset. After all, our husbands are human so they will make mistakes. We can choose to dwell on those and let bitterness take root in our hearts or we can remember that God’s mercy is new every morning and we should walk in it. If God’s mercies are new every morning for us, why do we not offer the same for our husbands? Being married… being one with someone… means that everything they do or don’t do… affects us more than if it were just a friend. Our husbands are the ones who we bare our souls to and our bodies… this leaves us more vulnerable and means that the pain from a betrayal or let down will cut deeper and hurt longer. With God’s help we can heal and overcome. With God’s help we can forgive and turn any test of our marriages into a testimony. My friend, Karen who writes at Redeeming Love, shared with me some scriptures that helped her turn their test into a testimony. Here are some of my favorite scriptures. I read His word and cried out to God so much while I was standing and praying for my marriage and family ? They lifted me and filled my heart exactly when I needed. I hope they encourage you too. Have you ever lost something dear to you and thought just show up, please? You look high and low – then look again, retracing every step and picking up every piece of paper in your path. Yet you are disappointed, distraught and even disgusted with yourself (or whomever!) for losing that precious thing in the first place. My husband’s wedding ring seemed to be missing – again. Not the first time this year, but the second time, his wedding band was MIA. We are wedded, yet I was deeply wounded by this loss. A gulf emerged, separating the two of us. Anger, hurt, and dismay warred within me. He remembers his watch, yet forgets ME echoed in my head. Silly, I know, yet in my mind, when he removes his wedding ring it seems to distance his heart from mine too. Anybody else dealt with similar thoughts and feelings, for whatever reason? Was I out of my mind to think like this? Holt loves me – and was distraught at the loss – his loss. With so much emotion at play, I had to decide to walk in wisdom. Emotionally rocked is a vulnerable place – and I do not want to put my marriage on the rocks! Would I wind up words, hurl them, hurt him-& our marriage–over a thing–his ring? Or would I line up beside him, raising hands and praising God for His faithfulness? God kept us together through the hardest loss of all, the loss of a child, a son, our youngest one. Family is key. Does a thing – a ring – really matter? There’s a better question – where is my treasure? Truth hit me – square in the face. This is exactly where the enemy wants me – and you – to be – warring with our husbands – for whatever reason. We must choose to build bridges built on love, trust, and hope with the mighty hand of God guiding us. So we looked again, thinking just show up, please. Seemed like nothing – except prayer and praise – would raise this thing! God knocked on my heart early today, so up I got out of bed and down I sat to read His Word and pray His will – with a special prayer raised for revealing the wedding ring, restoring the thing that symbolizes my husband’s commitment to our marriage. Knock, knock, Holt rapped on my door, something he seldom does when I pray. He just showed up at the door, raised his hand, revealing his ring, restored to it’s rightful place! Praise God! As I reflect, I see that only You, God, place that which is lost right in front of us – when we just show up in prayer and praise, trusting You to rise up when we need You. With over 2 million airline miles under her belt, an MBA hanging on the wall and 2 Christian Literary Awards on the shelf, Susan B Mead shares her expert teachings on business, grief and relationships. 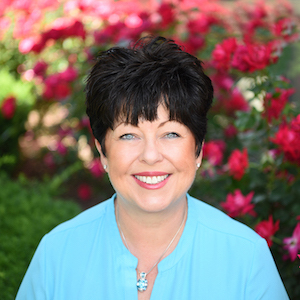 A master storyteller and award winning author, Susan leaves audiences motivated to live a life free of regrets even though she has done the hardest thing any parent can do – bury her youngest son, Kyle. Susan has been described as a solid, comforting voice in a messy world. Whether speaking to business professionals, women’s conferences, industry leaders or writer’s workshops, Susan’s insightful wisdom inspires audiences, empowering them to make healthy mental u-turns. How has your day been? Did you have a good conversation with your husband? Have you managed to enjoy some downtime together after work? This message has been weighing heavily on my heart these past few weeks. The message on choosing to love first. I pray for God to speak to you through these words as I type, knowing that only the Holy Spirit can convict and move our hearts. He came home happily from work. There was dinner on the table, and he was about to change out from his work clothes so he could play with our baby daughter, Ellie. It was one of those typical days. Nothing very special about it. I cannot remember what happened after that, but there was a miscommunication of sorts, and I just snapped. Yes, I was tired out from taking care of Ellie and yes, he may have been in the wrong. But in that moment, I was annoyed and frustrated, very desperate for a bath, and so I snapped. He was upset with me. I was upset with myself too. When we are married to another imperfect person, why do we become surprised when their imperfections show? After all, we are full of sin and weaknesses too. It is a choice that I’ve learned to constantly make. It does not matter who was right – that discussion can be done at a later time. But in every heated moment, there comes a choice that we must make – are you going to love first? When you love first, love becomes the priority, not whether he knows you were right all along. When you love first, you give him the space to be an imperfect person. He does not feel the pressure to change, and he knows he is loved unconditionally by you. When you make that powerful decision to love first, you are training your heart to be more like Christ. After all, Christ demonstrated such unmatchable love for us – by choosing to sacrifice and love us first. Endure the uncomfortable feelings knowing that there is a greater reward on the other side. Don’t miss the great wisdom that God wants you to witness through your obedience to love first. Rest in the peace of knowing that you are exactly where you should be – in the loving arms of God, loving the one you have vowed to be there for, in good times and in bad. Will you choose to fight for your marriage and love first today? I’m right there with you sister, and I am rooting for you. Give thanks to God. It not only shows our gratitude but it reminds us where all our blessings come from. In marriage, it is easy to get caught up in the day to day and start to look to each other for what we need. However, we set ourselves and our husbands up for failure when we do that. When we make a choice to give thanks to God it changes our perspective. Sure, our spouses bless us and so we look to them with appreciation but we must be careful not to look to them with expectations only God can fulfill. They are a gift from God. We should give thanks regardless of how we feel. I know there have been points in my life where I did not feel like giving thanks to God… for anything. I looked around and in that moment didn’t see anything good. I wanted to get mad and say anything but words of thankfulness. But I knew that God was still God no matter my circumstances. I knew I should give thanks out of obedience to His word. In those situations, as soon as I start to give thanks my attitude changes and every where I look there is something to thank God for. Did everything change in that instance? No, what changed was my focus. Instead of giving in to my feelings I decided to give in to my faith. My feelings have led me astray but my faith in Jesus has not. Our feelings and emotions are our flesh. We must do everything we can to welcome God and His presence in to our lives so that we can live by His spirit instead of our flesh. All the “bad” that was going on… was still going on… but in that moment I could see the good God was working out of the bad. We have been married almost 6 years. God has done a lot in those years. We have been through a lot. Sometimes we have felt like giving up. We have wrestled with the thought that our lives would be easier if we didn’t pursue what God was calling us to do. The truth is our lives probably would be easier but they would not be Godly. The thing that made our hard times harder instead of heavenly was when our focus was on us and not Him. When I was looking to my husband to bring balance and peace to my life it put pressure on him that was not his to bear. And it went both ways. We are getting faster at recognizing when we are doing this. We are trying to realize quicker so that we can readjust. When we are impatient with one another or when there seems to be a lot of miscommunication going on… our perspectives need changing not our circumstances. In those times we need to focus on God and all of His goodness and give thanks. Would it be easier for us and for our marriage if God would just change our circumstances? YES! Of course it would. But would that be the best for us? Would that prepare us for heaven? Would that draw anyone else to Jesus by our actions and obedience? Would that bring us closer together as a couple? Would that grow our faith and deepen our relationship with God? No. When we give thanks to God we grow our faith. When we depend on God individually it brings us closer as a couple. When others see how we point to Jesus in hard times they will be drawn to Him. Life is hard. Marriage is Hard. But if we let it… it will prepare us for Heaven. Life is hard. Marriage is Hard. But if we let it… it will prepare us for Heaven. Yielding my marriage to God is not easy. Giving up control of anything I care about is not easy. However, because I care so much is the reason yielding to God is the best choice. God is faithful and is working all things out for my good and I need to walk in that. When I hold on to control my marriage becomes a wreck as well as many other areas of my life. When I trust God and yield… I have peace. A peaceful marriage is so much better than hanging on to control. Especially when hanging on to control only leaves me exhausted. Once I give up control and release my grip (from the edge of the cliff I was so afraid to drop from) I land on solid ground (only a few inches down) that God had waiting for me the whole time. Last night Sarah woke up a bit ago crying. It was a pitiful cry. When I checked on her she was just sitting in her crib and it sounds silly but she looked lonely. So I picked her up and she wrapped her arms and legs around me. She gave me one of those hugs that makes time stand still. We all just need a hug sometimes right? I sat holding her in the rocker and just talked to her. I was thinking how nice it was just to sit and hold her and it hit me that God wants to hold us and talk to us too. She likes to hear my voice and it calms her. I will pray out loud or talk to her and tell her all the people that Love her. It gives her peace to hear my voice. The list of things being a parent has helped me realize about God grows daily. If we will be still and let Him hold us He will give us peace too. I often tell Sarah things that I hope will be seeds planted in her heart now and grow as she grows to help her depend on God through life. I tell her things like “no matter what happens in life, you praise Him and His peace will come”. I say “you praise him when others would be cursing his name because of Him we are not the same.” and that “we have to let God be God!” That last one seems so simple and obvious but I know we all struggle with it. I am teaching Sarah to pray….P.R.A.Y. When I was talking to her it hit me that of that list (pray-repent-ask-yield) most of us miss the yield part. We get so stuck on “but I’ve prayed about it” or “God knows my requests and I praise Him because He is in control”…and I get that mindset. We really think we have given Him control. However, I think we yield and then do a U turn! Or some of us never yield at all! What happens when you don’t yield while driving? ….Why are we surprised our lives are a wreck when we have not truly yielded to God. When our relationship feels strained or things just aren’t going smoothly and I am wondering “why things are such a wreck? !”… if I stop and consider who is in control and if I am yielding my marriage to God… I get my answer. 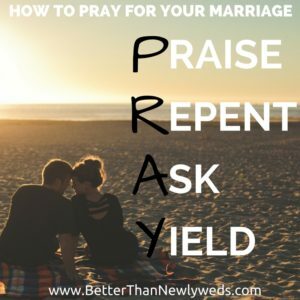 If I am pushing my plans on my husband rather than praying for him… I am not yielding my marriage to God. If I am worried about what others think more than what God thinks… I am not yielding my marriage to God. If I am talking about him instead of talking with him…I am not yielding my marriage to God.